I dropped into the National Gallery in London last week, keen to see the latest Room 1 exhibition; Giovanni da Rimini: A 14th-Century Masterpiece Unveiled. I love religious art of the 14th century, with its gold backdrops, symbolic colours and mystical depictions of saints and bible stories. But I sometimes feel daunted by the vast collections of that are often displayed by many museums, particularly in Italy. But this display makes you stop, think, and actually look at these beautiful objects, rather than just admire them at face value as beautiful objects. 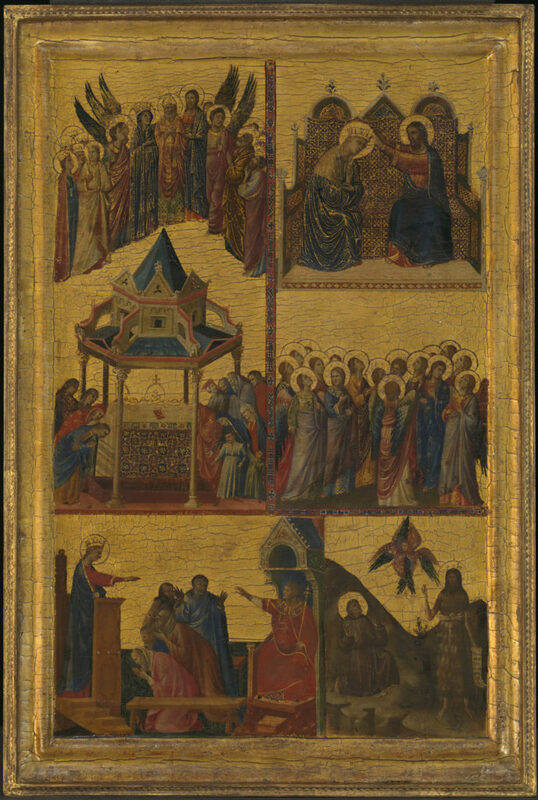 Giovanni da Rimini’s Scenes from the Lives of the Virgin and other Saints (1300-1305) is the standout piece in the gallery for me, and it is reunited with another panel known to be by the trecento artist from Rome’s Galleria Nazionale d’Arte Antica. It is immediately obvious that these are far further developed stylistically than the Byzantine icons, which so heavily influenced their creators. The figures are individualistic, their poses have been copied from life and their faces express realistic emotion. The panel below shows an attempt at perspective in the placing of bodies in space and architectural detail, albeit with the typical gold background, removing all sense of time and place. The bottom right-hand scene of St John the Baptist in the Wilderness is set in a rugged landscape, the realism of which is juxtaposed with the peculiar four-winged cherub head. This story would have had a strong resonance for the monastic order for which it was likely commissioned, the Augustinian hermits of Rimini. The work below by Giotto, one of the most important 14th century artists in terms of developing realism, shows how far ahead of the curve he was. Although not entirely convincing in its realism, this panel shows a determined endeavour to create a realistic three-dimensional space in which to set his figures. The faces are definitely of a certain type, but they are individualistic. Pentecost is the gathering of the twelve apostles after Jesus’ ascension to heaven. As these men converse, a dove representing the Holy Spirit descends upon them. The fiery tongues above their heads indicate that they have been blessed with the ability to speak in different languages. I love the man on the far left-hand side, having a moment of private contemplation and eavesdropping on the meeting behind him. This panel would have been part of a large altarpiece that is thought to have been made for a Franciscan church. 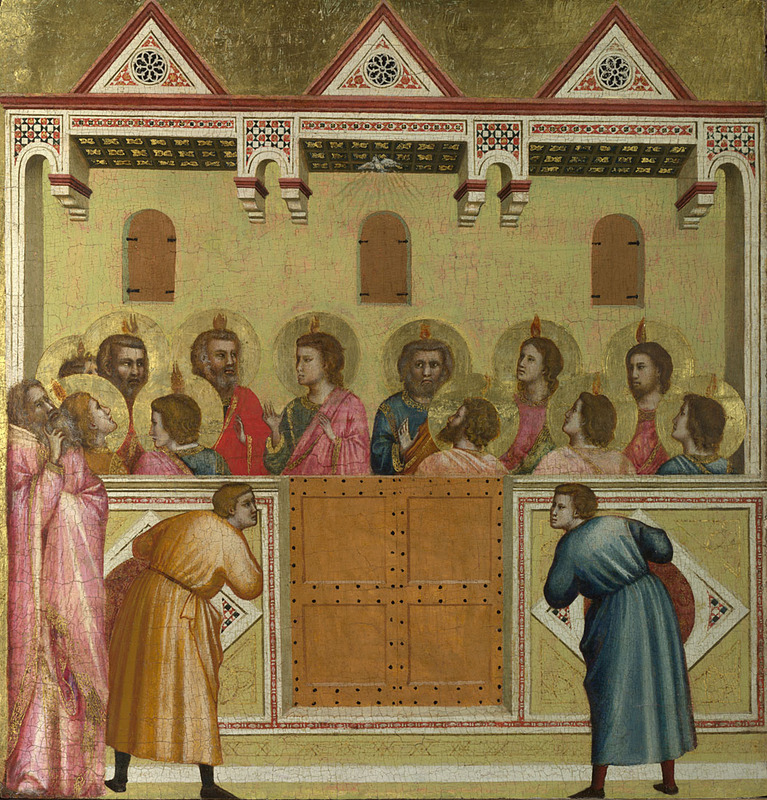 It is known that Giotto visited Rimini around the time that this was painted, and it is clear that his influence was absorbed by the Riminese artists of the time, Giovanni da Rimini included. 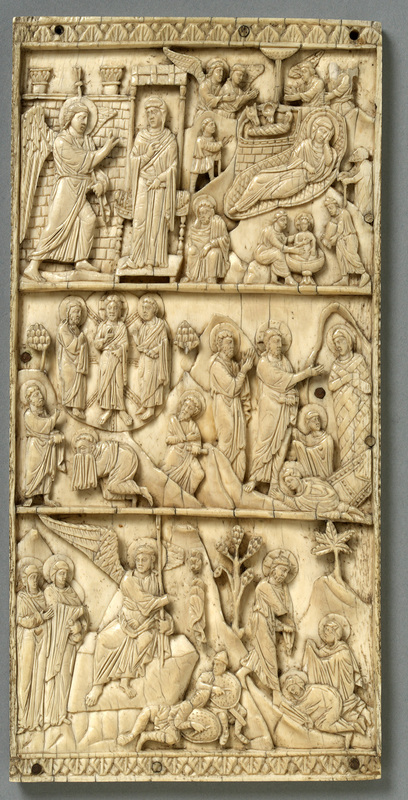 Two astounding ivory panels are included in the display. The one below dates from the 1100s is just 25 × 12 cm, but is so intricately carved. The maker (who is unknown) has achieved an amazing depth of carving is astounding, and it is so delicate. The attention to perspective is charming, if not very sophisticated. But this, as with the other works of art in this display, was made to serve a purpose as a devotional object. It tells a biblical narrative that is depicted in such a way as to inspire spiritually focussed prayer and contemplation. It is interesting to compare this to the oil on panel counterparts in the exhibition, as it shows that stylistic developments did filter through the decorative arts too. From enormous altarpieces to small portable religious aids, we justly consider these objects works of art. Although there are just 10 objects on show here, it is well worth visiting, if only just to experience a very rare and beautiful collection of artworks.